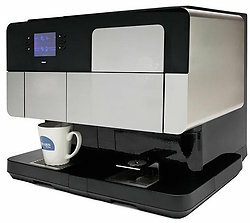 Flavia Barista plus Espresso Machine. A beautiful machine, built from stainless steel, with a glass touchscreen.? The fit and finish on this machine are simply top notch.? Very similar to the Flavia C-500, but with upgraded materials, and the addition of an attached espresso machine. The espresso component uses the exclusive "Red Nozzle" flavia packs, and are not interchangeble with the other Flavia Packets.? It utilizes pressure, time and a brewing routine that produce an espresso you will be proud to serve, and you can certainly taste the difference. Can use all of the Flavia Coffee, Tea, Hot Chocolate and Froth packets on the left. PLUS, the additional use of the Red Nozzle espresso packets on the right. Perfect choice for customers that want a premium experience, but need a commercial brewer that will fit underneath their cabinets in the break room. This machine has a monthly rental of $34.95 a month, and a minimum of 25 cups of hot beverage usage per day.